Back in August I spotted the McCall’s M6992 on Just Jax’s blog. She had made a rather fetching elephant print version, and I wrote down the pattern number in my notebook for something to have a look at later. Then I sort of forgot all about it until the weather started to get chilly and autumnal and I realised that I would love a raglan sleeve sweater. 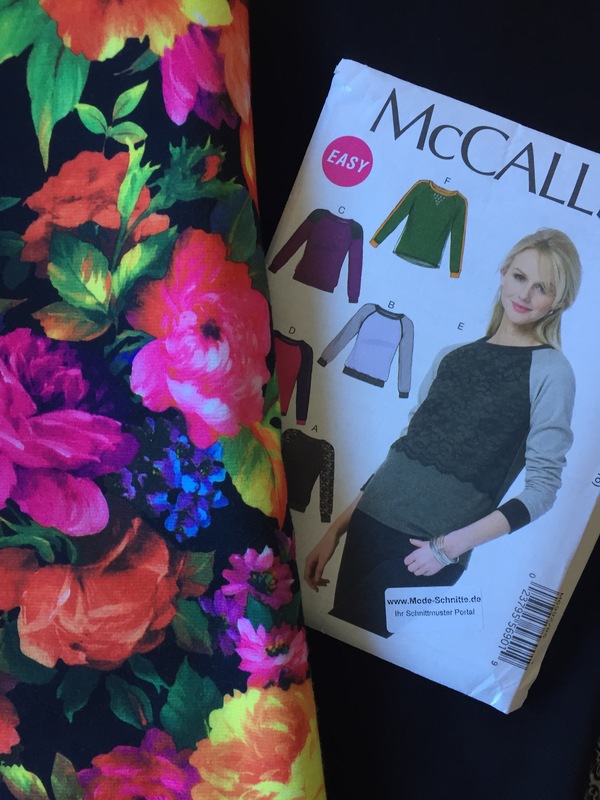 There’s been lot of noise recently about the Lane Raglan, but the McCall’s M6992 was available on Amazon to purchase right here in Germany at a very reasonable price and with free delivery so I decided it would be just the ticket. Thanks Mode-Schnitte.de! When I went fabric shopping for this top, I sort of decided I would let the fabric inspire me. This is a great pattern for being able to use an exciting print, so I settled on this really bright floral. I’m not normally a floral person, but I have to say since I have been sewing my own wardrobe, the amount of exciting prints and colours in my wardrobe has increased ten fold! I just feel so much more adventurous than when I go shopping on the high street – do any of you find that?! 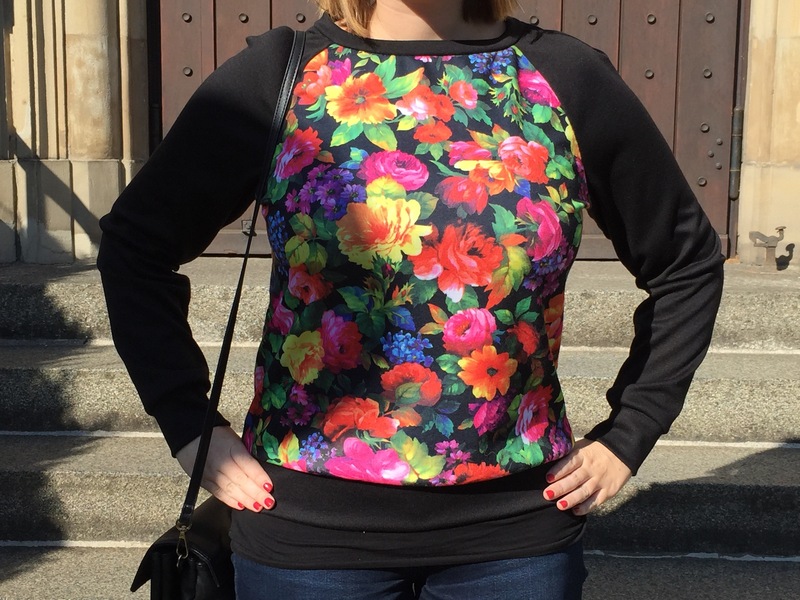 I wanted to make view B, the contrast sleeve version, so I paired the bright floral with a lovely black thick jersey knit that has a sort of shine to it. What is extra exciting about this pattern is it only requires 1.5m of fabric, so it’s purse friendly too! Overall I was delighted with the finished garment. This has to have been one of my favourite garments to sew and I was really pleased with the finish and fit. I cut a size 16, which was the largest size my pattern packet had to offer (I believe you can also buy a separate packet with larger sizes). As it was the largest size, I did something I never do and just cut the pattern right out of the tissue *gasp*. No tracing here! The sizing chart on the pattern packet wasn’t that helpful – I went from the bust measurement and knew after that I was winging it. None of my other measurements seemed to correspond well to any of the measurements on the packet, so I thought I’d just make up the largest size and take in as necessary. In the end, I was so delighted with the fit that next time I wouldn’t make any adjustments at all. This is one of those rare patterns that I made straight out of the packet, no adjustments and the sweater fits me perfectly and I love it just as it is! I love it so much I’ve worn it twice already since I made it. 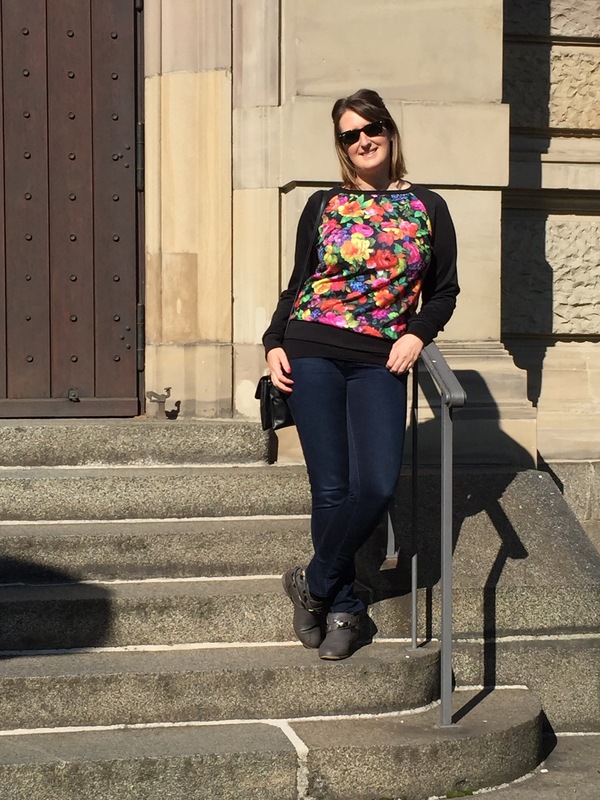 We took a little road trip to Mainz to get me out and about again post surgery now I am feeling better and it was so sunny, I thought it would be a great time to wear bright florals! 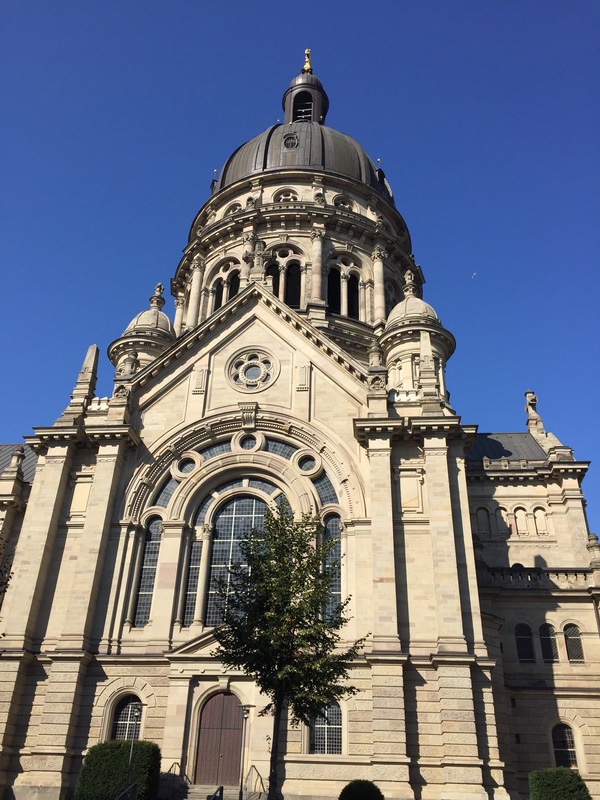 We found this beautiful church! Which we decided would be a good photo opportunity for the jumper! I plan to make a second one of these using the same black jersey for the sleeves, with a black lace layered over black jersey for the body. I am thinking it will be great for work in the winter – smart and warm! Funnily enough I am already on my way to starting the second one as I accidentally made two left sleeves for the floral version (yep – it’s hard to tell the right side from the wrong side of the fabric on a black jersey!) I’d already attached the cuff and everything, so that’s one sleeve down, one sleeve to go on version two! It would be a shame to waste it! I imagine this is the first of many McCall’s M6992 – it’s so versatile with so many different possible variations – I’m already imagining a whole wardrobe of them. It could do everything from Christmas jumper to light weight long-sleeve T-shirt and it’s great from a construction point too! This is certainly a pattern I would recommend purchasing! How about you – do any of you have any pattern favourites? I’d love to hear all about them! Psst! In case you haven’t entered yet – I am giving away a WHOLE BOX of vintage patterns here! Leave a comment on this post by midnight tonight and the box could be yours! Super cute! Love the floral. Very pretty! I think I have that pattern.